Benque Guest House Hotel is located in the San Ignacio Cayo area and is your ‘hotel home away from home‘ while you discover the secrets of Benque, San Ignacio, Tikal, Guatemala and the entire Cayo District of Belize. Our eco-friendly guest house and hotel offers Cayo accommodations with private baths, patios overlooking the Mopan River and a peaceful, quiet atmosphere. Dine out locally or at San Ignacio restaurants OR make use of the well appointed, kitchen facilities on the main floor. Our Cayo hotel and guest house accommodations have all the modern conveniences… Every hotel room accommodation has a Klipsh iGroove stereo, ready to plug in your iPod. 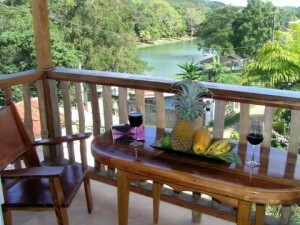 You’ll also find A/C, hot water, high speed internet, and free phone calls to all areas outside of Belize. There are many Belize Cayo tours and activities in the Benque, San Ignacio and Cayo areas while you’re visiting us at the Benque House – Cayo hotel. We can assist you with bookings as you discover all that the Cayo area has to offer. In addition to Belize Cayo accommodations, we can help with Belize Adventure Tours and Activities including: Barton Creek Caves, Chechem Ha Cave, El Pilar Mayan Ruins, Carocol Mayan Ruins, Xunantunich Mayan Ruins, Horseback Riding, Birding, River Trips, Tikal Ruins, Guatemala, Flores.